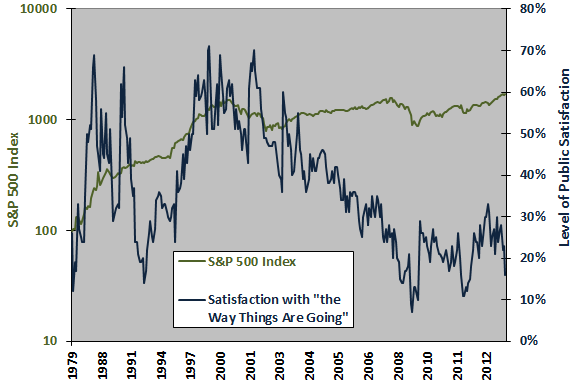 The following chart shows the S&P 500 Index (on a logarithmic scale) and the level of public sociopolitical satisfaction over the entire sample period. The horizontal (time) access is irregular because of variations in polling frequency by year. It appears that there may be some intermittent relationship between the two series, but they trend in opposite directions during much of 2003 through 2007. 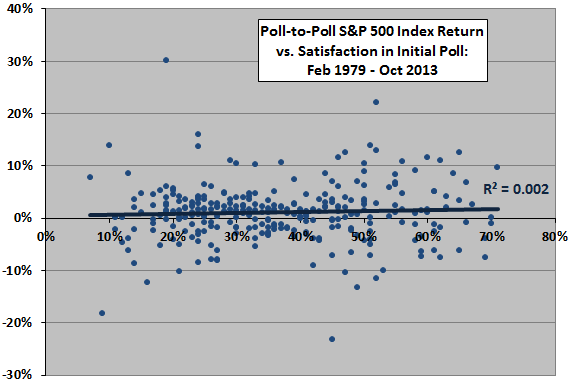 Based on the nature of the series, it makes more sense to compare S&P 500 Index returns to level of public satisfaction. The following scatter plot relates S&P 500 Index poll-to-poll return to level of public sociopolitical satisfaction for the earlier poll. The Pearson correlation between the two series is 0.04 and the R-squared statistic is 0.002, indicating that level of satisfaction explains practically nothing about future stock market return. Nor does it appear that the relationship has interesting tail effects. 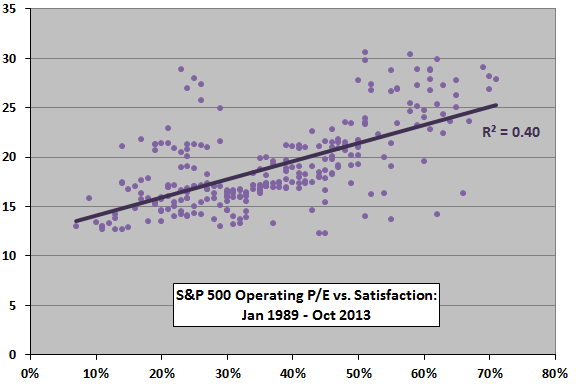 Might level of satisfaction relate to market P/E? 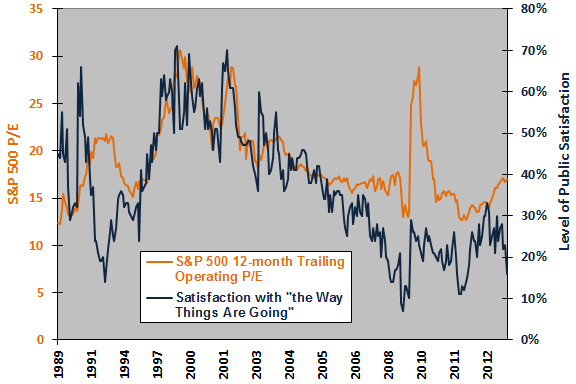 The next chart shows market P/E and the level of public sociopolitical satisfaction over the available sample period (operating earnings data is not available until the end of 1988). Again, the time access is irregular because of variations in polling frequency by year. There appears to be a relationship between these two series in terms of both broad trends and finer features. For another perspective, we use a scatter plot. The following scatter plot relates market P/E to public sociopolitical satisfaction over the available sample period. At the polling frequency, the Pearson correlation between the two series is 0.63 and the R-squared statistic is 0.40, indicating that variation in satisfaction explains 40% of the contemporaneous variation in market P/E. In other words, P/E is a rough proxy for level of sociopolitical satisfaction, perhaps reasonably interpreted as level of willingness to take risk. Does either series lead the other? 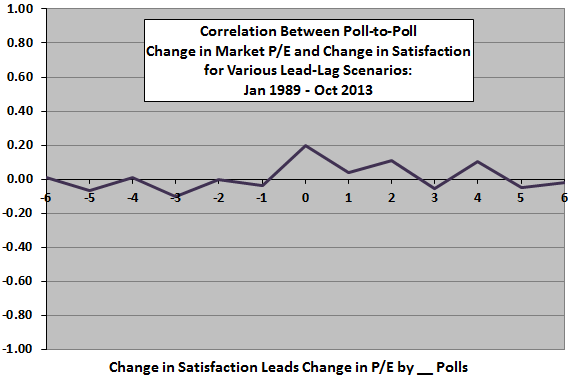 The final chart summarizes Pearson correlations between poll-to-poll change in market P/E and poll-to-poll change in level of public sociopolitical satisfaction for various lead-lag relationships, ranging from change in P/E leads change in satisfaction by six polls (-6) to change in satisfaction leads change in P/E by six polls (6). The strongest relationship is coincident (0). If either series leads the other, the case is slightly stronger that changes in satisfaction lead changes in P/E than vice versa. However, indications are weak and results are noisy. In summary, evidence suggests that public sociopolitical satisfaction and stock market valuation (market P/E) move substantially in step, with no reliable way to exploit the satisfaction measure for stock market timing. Sample size is modest with respect to the numbers of independent annual earnings measurements and very small with respect to number of four-year political cycles. The above analyses are in-sample (retrospective). An investor operating in real time during the sample period would not know all the data used in the charts above and may draw different conclusions based on strictly historical information.